Livable4All - Veronica Walsh - Air can pollute? AIR Contributes to Air Pollution - True or False?? When I open a box of cereal, detergent, dog food, cereal bars, icing sugar, crackers, Halloween treats or a bag of chips, dried fruit, pretzels, popcorn or candy. What do I find? I am going to be generous and say 2/3rds product and 1/3 air. Sure manufactures will say that they filled the container with product and it settled during shipping. In reality, the container was never filled with product. However, the two may have been distributed differently before shipping. While I have heard much about pollution, the environment and climate change, I have heard nothing said about implications of packing methods and product distribution. So I would like to begin a dialogue about these issues for my own information. My questions are: Why so much air? Is any air necessary? Why? And for what products? If it takes 99 containers to hold what could be put into 66 containers (or 999 containers to hold what could be put into 666 containers) how many extra trucks/ ships or railcars does it take to get the enough product to all of the locations that want the product? What does this add up to in terms of air pollution? (Please be assured that I am do not want to put truckers or anyone else out of work but clean air is essential). Assuming the product is loaded and unloaded at various warehouses and distribution centers how many extra hours do the forklifts churn out emissions in order to complete the job? What is the cost to our environment and health for this? How much packaging is being produced, shipped and disposed of to accommodate all this air and never actually contains any product? Since all costs are passed on to the consumer, what are you and I paying for this air, plus the packaging, shipping and handling of it? What is the quality of this air coming into our home - clean or big city SMOG? Are some manufactures getting better at streamlining packaging and others getting worse? Which ones are which? Are there any groups or agencies working on these matters or issues? If so, what are their names, addresses and focus? Do you need to communicate our concerns to manufactures? 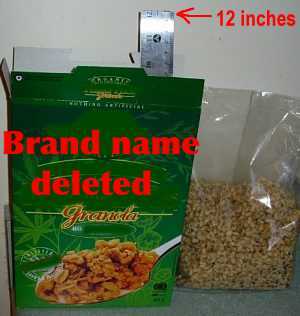 And what about all the other packaging for non-food items? Are items over- packaged or under-packaged? Which are over and which are under packaged? Are the styrofoam protectors too big or too small - resulting in the boxes being too big or too small? Are the plastic bags used for many items and components, used in addition to the styrofoam and boxes, necessary? What impact does this have on our environment and us? Note from LIFE: many, many current economic activities are inherently wasteful because many methods of "making a living" have harmful outcomes for peace, health and the environment--all because we don't yet have a guaranteed income. There is huge competition for consumers by manufacturers of processed foods. They have to use big packaging to compete with other products on the shelf. "Corporations are mandated, in effect, to 'grow or die,' a rule also called 'the growth imperative.' ... food companies face special challenges when it comes to obeying the market's growth imperative: because there's a limit--in theory, anyway--to the number of calories humans can consume, competition is especially fierce among food makers for a finite pool of money that consumers can spend." In addition to wasteful packaging, there is the waste of the whole advertising industry which some estimate to cost $500 billion a year. But if you understand the desperation factor -- because there is no guaranteed livable income, people need to keep their way of "making a living" even it that means designing wasteful packaging for wasteful unnecessary products until we can end a forced production/forced consumtion economy with a GLI. See our environment page for more on this. And our Consumption and Health pages.